Despite the fact that its growth has slowed down during 2018, React still continues to dominate the web scene. The 60% of npm survey respondents said they are using React. The npm predicts that in 2019 more people will use React for building web applications which will lead to more tutorials, cases and bug's being fixed. 2019 will be the year of GraphQL. 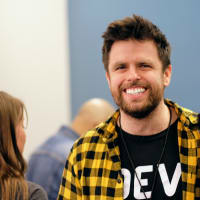 There is a strong likelihood that developers will use it in new projects in 2019 and afterward. 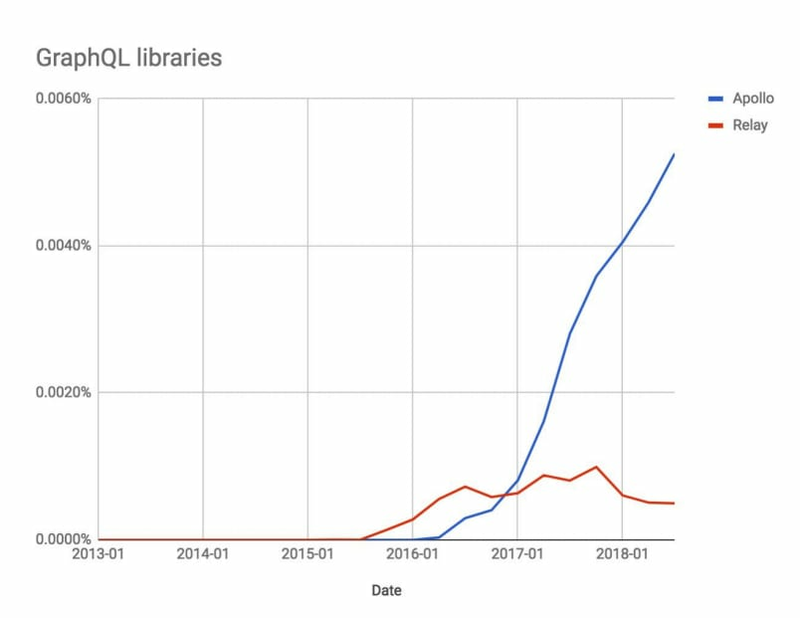 GraphQL, tracked by its most popular client library Apollo, continues to explode in popularity. GraphQL it’s going to be a technical force to reckon within 2019. Sounds like a lot more of 2018 to me. IMHO 2019 is the year of Web Components, as Microsoft Edge will be the last evergreen browser to adopt the Custom Elements v1 spec. Web Components largely make UI libraries based on component patterns obsolete, with the exception of how libraries like React make components stateful of course. Why should a team in 2019 considering how to build UI components use React when a huge chunk of the API for developing a component is baked into the browser with Custom Elements v1? I recently built a micro library that makes Web Components stateful and the entire library bundles down to under 2.3Kb minified. "one recruiter I recently spoke to React only accounts for 7% of job requests flowing through their agency." Tech stacks can cluster around particular hubs in different cities and countries. I'm in a MERN stack hub here, but in other places you might look at the local market and realise it's all LAMP or the front-end is vanilla JS and jQuery. Had a company present at my bootcamp who used Backbone with no plans to migrate away. Trends change from place to place. How do you import your library into your web component? 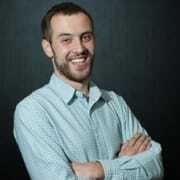 By leveraging webpack? Because I can do SSR with React. 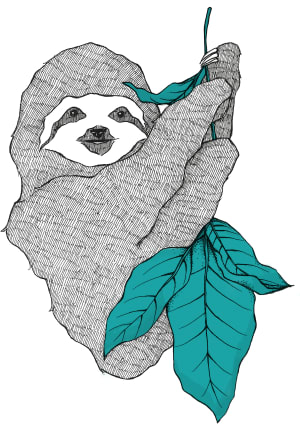 Single codebase for both backend and frontend. I'm a little confused how a 0.005% registry share implies that 2019 is the year of GraphQL. 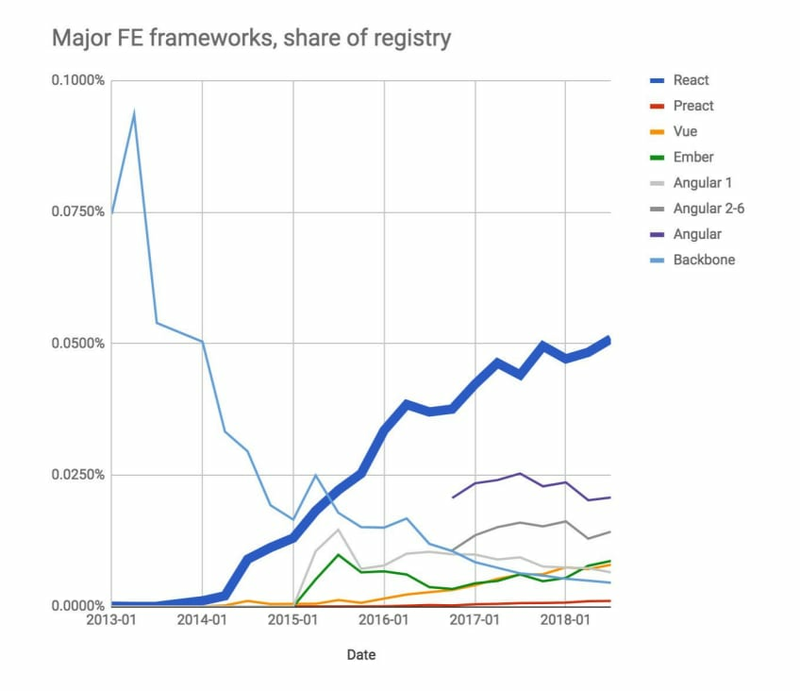 If we extrapolate from some other numbers in the study (React has 0.05% registry share and 60% market share among frameworks) we can gather that about 6% of developers using a framework are also using GraphQL (assuming everyone using GraphQL is using some framework). It seems like this study is seriously overhyping the prominence of GraphQL, and I'm not convinced it'll hit mainstream this year or next. What about Vue.js? it's getting more traction every month. What do you think about it? Agree, Vue seems to be a solid alternative to React. I think next year will be the year Typescript really explodes in popularity. Especially with Vue being rewritten in Typescript. React is a great framework but that doesn't mean it will be the dominant framework based on the number of downloads or GitHub stars, not a valid metric.